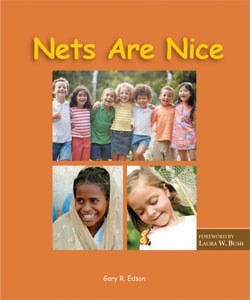 …a FREE downloadable book for children about malaria and the role of mosquito nets in prevention. This book by Gary Edson, with a forward by First Lady Laura Bush, is published by Malaria No More, in conjunction with Scholastic. Whatever your opinion on the Malaria No More campaign (and I hope you’ll visit the website and think about the subject enough to form an opinion) I think this free book is a beautiful way to help American children think outside their little world to the bigger world. The photos are stunning, and the text is simple. There is a malaria fact sheet at the back of the book. There is also a malaria knowledge quiz at the Malaria No More website. If World Malaria Day seems irrelevant to you, or just one more world problem to think about when you are bombarded every day with world problems, I understand. I’m not into asking you to do something specific or predetermined about malaria. (Heaven forbid that I, who am so skeptical of campaigns, would start one of my own 🙂 ). On this, my third post of the day (that’s got to be some kind of record for me! ), focusing on malaria, I’d like to leave you only with the suggestion of printing and reading this lovely little book and taking a few minutes to stop and recognize–to make space for thinking about–one particular type of suffering that affects a great many people in our world today, every day. The second of three posts in consideration of today being World Malaria Day. Follow this link to post one (with a vivid photo of malaria in action). Although the exact number of Confederate Army deaths from malaria is not known, there were 41,539 cases in an 18 month period (January, 1862-July, 1863) in South Carolina, Georgia and Florida. The cause of the disease was not known and soldiers often slept without the protection of mosquito nets. ~Malaria was a very real problem for the Ingalls family in their Little House on the Prairie. ~Malaria struck the fledging settlement of Cleveland, Ohio, in 1798. One young boy, Seth Doan, “kept everyone in Cleveland fed during the epidemic. Thanks to his efforts, no one in the settlement died.” A fictionalized account of that summer of malaria and Seth’s role in saving the lives of the people in the settlement is recounted in The Boy Who Saved Cleveland, by James Cross Giblin. This historical fiction novel for children is only 64 pages long. ~There is only one species, out of the 3000 or so species total of mosquitoes, that carries malaria, and even then, it is only the female (I haven’t substantiated this information, but, from what I understand, the females live on human blood, the males on fruit.) You can tell the differences in species of mosquitos by the presence or absence of stripes and also by whether or not the back legs are resting on you when she is biting versus lifted up. I could never remember which signs indicated a malaria carrying mosquito, and, personally, I prefer to kill them all. As I mentioned in my last post, I tend to be a bit skeptical of the efficacy of campaigns and causes. I must say if money is going to be thrown somewhere, I’m at least a little bit happy that some of it is being directed towards research for a disease that doesn’t primarily affect the Western World. Still, while I commend these well known people for taking malaria seriously and bringing its devastating impact onto our radar screen, I’m not exactly recommending their approaches. In general, I tend to think that for every well intentioned Super Solution, a few more problems (some of them Super Problems) tend to be created. G. M. Prabhu left an insightful and thought-provoking comment on Lingamish recently, which addresses some of my concerns and hesitancy. I hope you will read the whole comment, but if not, at least read paragraph #8, which has some highly relevant thoughts for today’s focus on malaria prevention and treatment in ways which do not undermine, demean or generally disregard the actual people help is being offered to. Those are a couple of your poor red blood cells exploding (or are they deflating rather limply?) from malaria. The oxygen that the blood cell carries has been paralyzed (maybe disabled? destroyed?). And it’s not getting where it needs to go. A body not getting the oxygen it needs in the liver and brain is not a happy body. Admittedly, my technical understanding and explanation of how malaria does its thing is lacking. 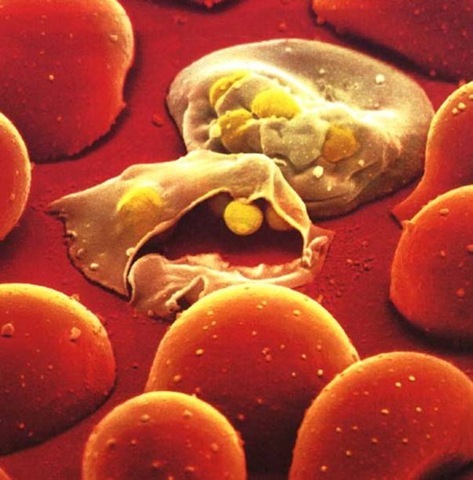 But, having experienced the effects of this parasite, I will say that this visual of the red blood cells losing the battle to malaria was a pretty accurate representation of how miserable one feels when suffering from malaria. When I had malaria, I had it with the benefits of already being on prophylaxis, which although it doesn’t prevent the disease, usually gives you a bit more time before the disease (at least the cerebral form) becomes a life or death crisis. Plus, I had money for treatment, and the ability to call a doctor in the middle of the night, who called the pharmacist in the middle of the night, who for an extra fee, opened up the pharmacy and sold me the treatment. Malaria is preventable (mainly by avoiding getting bitten by mosquitos), and it is treatable. Still, many people die from it every year and many more get it and suffer from it over and over, in a cyclically debilitating fashion. I don’t really know how one can estimate the big picture effects of malaria, in terms of life, functionality, performance, overall miserableness and quality of life, etc. But it’s effect IS big. Eradicating malaria, like just about any campaign (for example, eradicating poverty), is fraught with overly simplistic solutions and overly complex complications to those solutions. Still, for all of my cynicism about campaigns and causes, this is one cause I do care deeply about. You can learn more about malaria and some of the big names working to fight it at the Malaria Consortium website. Malaria (and the mosquitos that carry it) is a fascinating and interesting topic to me. If I have time later in the day, I might ramble on about it some more. But, for now, at least, on this end of the day, I wanted to draw your attention to this preventable, but devastating disease, which continues to affect and kill many people around the world each day.